The other day, one of my partners requested me to supervise a cardiopulmonary exercise test (CPET) that he ordered on a patient that he saw in our clinic. Since I would be in the hospital all day that particular day, and the exercise test would be done in a lab in the hospital anyway, so I obliged. CPET is usually a test that we request if the cause of shortness of breath remains unclear even after initial evaluation. Most of the time when we request a CPET, we have already done lung imaging (like a chest x-ray), a pulmonary function test, and basic heart evaluation to rule out gross cardiac problems. Definitely we don’t want a patient having a heart attack and keeling over while we are performing the test. During CPET, a patients walks/runs on a treadmill or pedals on a stationary bike, while having all these body monitors to measure the heart rate, blood pressure, and oxygen saturation level. Then they also wear a mask, like the super villain Bane in the Batman movie, that is attached to a breath analyzer where we measure not alcohol content, but the volume and gas content (oxygen and carbon dioxide) of the air they inhale and exhale. At the peak of the exercise, we also draw a blood sample to measure the level of oxygen, carbon dioxide, and lactic acid. We may not be experimenting on Captain America, but it is an intense test regardless. By the way, lactic acid is a byproduct of “overstressed” metabolism. It is produced when there’s not enough oxygen supply to the contracting muscles, so the muscle switched from aerobic to anaerobic metabolism. The build up of lactic acid in the muscles is one of the cause of having pain in your muscles few hours or few days after a viogorous exercise. I hope I am not bringing back bad memories from your high school physiology teacher. The exercise test is usually ended in several possible ways: a patient cannot exercise anymore due to exhaustion, or we have achieved the maximum target heart rate (which is: 220 minus patient’s age), or we have reached the end of the designed exercise protocol, or the patient developed an alarming symptom, like severe chest pain. The information we gather in this test help us delineate what is the limiting factor causing the shortness of breath, whether it is a heart problem, a lung problem, a muscle problem, or plain deconditioning. Sometimes elite athletes undergo this test to gain data on how they can improve their performance. I’m sure Gatorade lab performs lots of this. Perhaps the most common diagnosis we reach considering the group of patients we deal with, is deconditioning, or in simple term, being out of shape. Definitely this is a scientific way, albeit expensive, to say to a patient that he is too lazy or is too fat. The duration of the CPET is mostly less than 15 minutes, and with our patient population, it rarely last more than 10 minutes. Not a big deal for me to supervise the test, as it is short and quick. I was busy that day so I was not able to look beforehand at the chart of the patient whose CPET I would supervise. What I just know was the time I needed to show up in the lab, the name of the patient, and his age. When I came to the lab, I met our patient who was already sitting on the stationary bike. He looked fairly trim, and to be honest, he looks younger than his age. I introduced myself and explained the test that we will administer. To get some idea of his condition, I asked him about his symptoms. He told me that he felt this “disproportionate” shortness of breath when he is running. Sensing that he is a “runner” like me, I asked if the shortness of breath happens early, or during the latter part of his run. He answered that he experienced this shortness of breath relatively “early” in his run. I asked him then to be more specific, like how many minutes after he started his run. What?! Who considers 25 miles as early? Most people are not short of breath, but may not be even breathing at that point! That’s when I learned that he was an ultra-marathoner, and runs 50 to 100 miles or more when he competes. He said that after 25 miles of running, he usually catches his “second wind” and feels good the rest of the way through. All my preconceived notion flew out the window. Life is never short of surprises. Another lesson learned. Never assume. I just told the lab staff to commence the exercise, and brace for a long, long test. Here in the US, there are two occasions in a year, that people are strongly compelled to exercise. During these times there is a considerable spike in gym attendance. This is based at least in my observation and purely my opinion only. The first one is during early January, when everybody is jumping on the band wagon for the New Year’s resolution to exercise, lose weight, and join the gym. However by the end of January, some if not most of them, have already fallen off the wagon. The second occasion is right after Thanksgiving, when many are feeling guilty they over ate during the holiday. According to one study, an average American will gobble 3000 calories during Thanksgiving dinner. But with all the snacking throughout the day, it can easily amount to 4500 calories in that day alone. Some will reason that they can burn all those calories when they go shopping on Black Friday. However, unless you go jumping rope while shopping or you’re hauling or carrying a piano, the amount of calories burned is not even close. One exercise physiologist estimated that in order for a 160-pound person to burn 3000 calories, he has to walk 30 miles. Or if you want to burn them faster, you can run. For 4 hours! So this weekend, I avoided the gym altogether since I know it will jam-packed. This morning, I decided to run outside instead. The problem is during this season, in this part of the world, it is already pretty cold. In fact, we already had snow and freezing rain this past week. Today is no different, the temperature was subfreezing. Good thing is that I have invested on nifty cold-weather running apparel that I can be warm and toasty even if the temperature is below freezing. 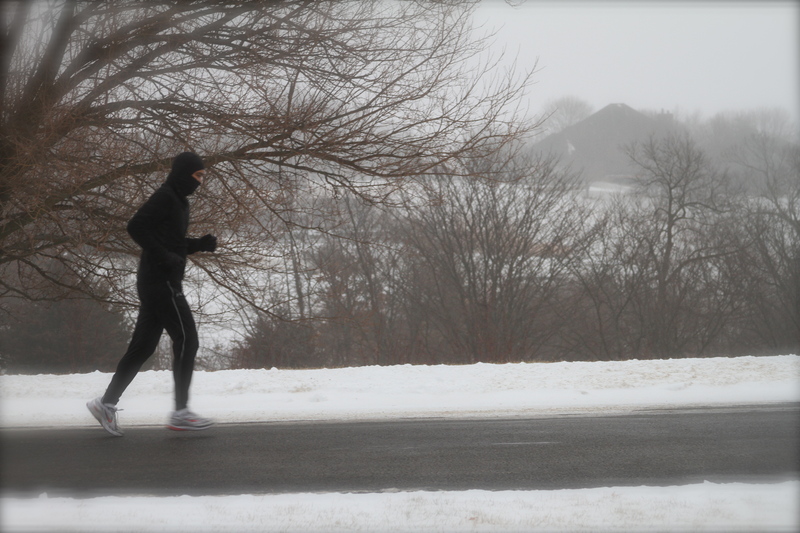 So I layered up, summon the spirit of the Black Ninja runner (see previous post), and ran. I was a little chilly when I started but by the second mile, I was already feeling warm that I took off the hood from my head. By the third mile, I already unzipped my outer layer. I ended my run after 4 miles, and I was all sweaty and hot that I even took off my jacket, at least temporarily, as I was walking to cool down. I checked on my smart phone, and the temperature was a nippy 29º F (-2º C). I believe my run will partly burn off all the turkey I ate. Though I still have to burn all the kare-kare* and krema de fruta*, which were what I really feasted on during the Thanksgiving dinner. Now I’m feeling hungry. Where’s the left over kare-kare? 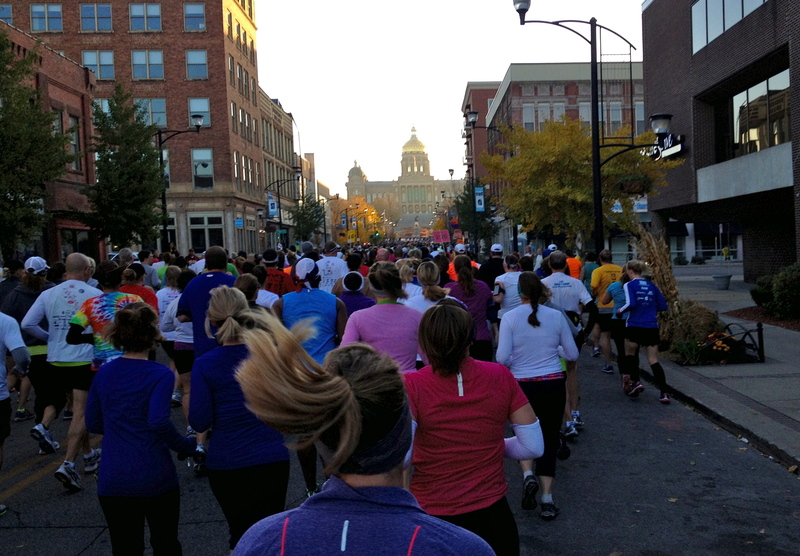 The annual Des Moines Marathon is less than 3 weeks away. And I am in no close form to run it. For the past 5 years, I participated in this yearly event, running the half-marathon (13.1 miles). This year I learned that a classmate of mine from medical school who is also now living in the US, but in another state, is participating in this run. Even out-of-towners are joining this event, not to mention some elite runners as well. Participating in this annual race keeps me committed on my running and hopefully this keeps me fit and healthy, which is the ultimate goal anyway. I know it is not hard to find a hundred reasons to stop running and it is so easy to fall off the wagon, and stop exercising at all. Doing this half-marathon at least once a year keeps me motivated. Or unable to button my pants, or an innocent yet honest remark from my kids about my bulging belly, will also do the same. If I follow the running gurus’ advice, like the Hal Higdon’s training schedule (click here) on how to prepare for the half marathon, my long runs should be at least 8 to 10 miles by this time. Adhering to these recommended training schedules assure you that you cross the finish line on race day without killing yourself. But I loosely follow those schedules anyway. Yet, even if I am not on track in my training for the half-marathon, there’s no urgency for me to train hard. The truth is I was not even training at all. I have not run a distance of more than 3 miles for the past couple of months. I am indeed slacking. Why? Have I lost the motivation? Have I resigned and accept my bulging midsection? Not at all! About 3 months ago, I learned that on the weekend of the scheduled Des Moines Marathon is the date that my kids will have their piano competition. And I will not miss the world for that. So we will be out-of-town at that time, and thus I cannot do the run. So I forgo on my training. However last Sunday, just to challenge myself, I push to run 5 miles in less than an hour, and I felt good about it. Next weekend, if I can run 7 or 8 miles, then it is as if I am ready to run the half marathon, even if I am not doing it. You have met the Black Ninja before. He is a fearless runner and is not afraid of rain, cold, or snow. But is scared of “black ice,” for he is not fond of slipping and sliding on icy road. He does not know how to use a samurai sword. Then you met the Lone…..ah….er….. the Wrong Ranger. He loves to take a hike and climb mountains. He does not have a horse, and does not know how to ride one. 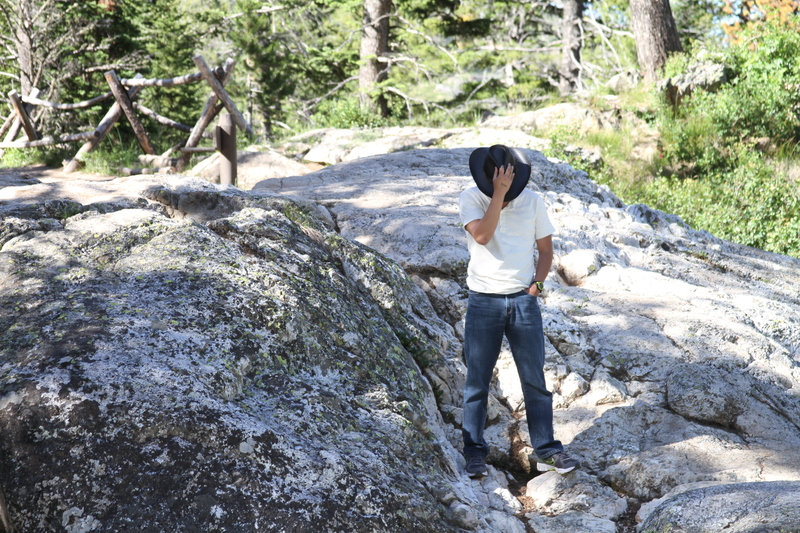 He’ll appear for a photo shoot, only to disappear in the shadows. And now, I introduce you to Lance (under)Armstrong. 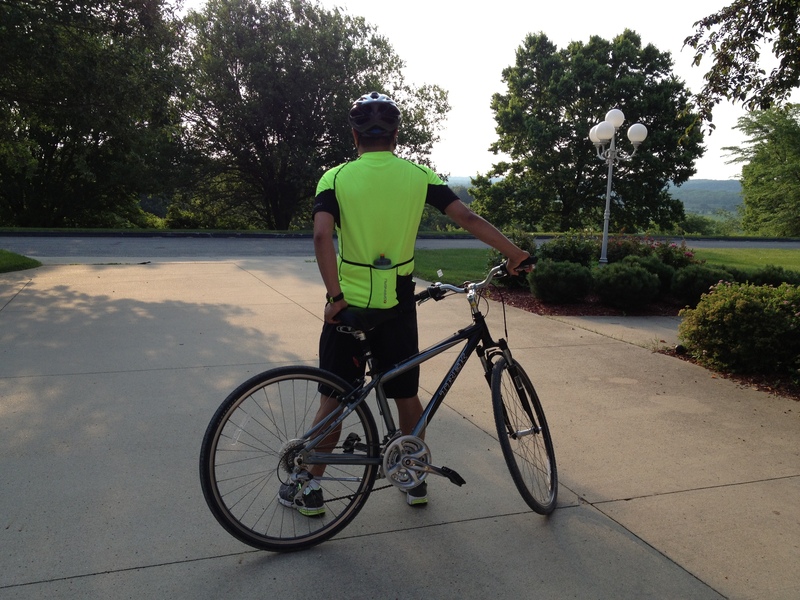 A cyclist wannabe. A slow rider. But is not afraid to get sweaty. The only thing that is “strong” is the “underarm.” He really needs to take his shower. What? Who are you calling Dr. Jekyll? Running is a simple sports. You don’t need a lot of equipment or gears. Just a good pair of running shoes and the endless road ahead of you. Well, not quite. Not if it is cold. There is winter running apparel available in sports stores, that are light and yet warm. However, even with these gears, once the temperature is in single digits (Fahrenheit), or worse if it’s below zero, they don’t feel warm enough at all. And I am not recommending running with a parka on. Of course one can run indoors in a gym. Although, running in a treadmill is so unnatural for me. It is really boring. If it is just a mile, well, I can bear it. More than that, I just feel like I’m running and not going anywhere at all. For that is exactly what it is! There are also indoor running tracks, which fortunately the gym where I am a member has. One lap is 0.1 mile. Actually, this is where I usually run in the winter. Again, after running more than a mile or so, it feels dull and repetitive. It is like running in circles. Then again, because that is exactly what it is! I still prefer to run outside. Feel the wind in my face. Breathe the crisp cold air. Enjoy the beautiful winterscapes. Run and really go somewhere, and not just in circles. As long as I don’t freeze to death. Last Sunday morning, our temperature wandered above the freezing point. 33 degrees Fahrenheit (0.5 Celsius) to be exact. I know it was still cold but I decided it was a good day to run outside. My wife said that I was crazy. I admit, maybe just a little bit. She even took pictures of my craziness. I donned my cold weather running gear, complete with thermals, gloves and balaclava headgear, which I just call my Ninja mask. There was snow on the ground but the road was plowed and cleared. No problems, so I thought. Ninja runner. Where’s my sword? When I stepped outside, it was foggy and even gently drizzling, but it was not too cold at all. However, I have not gone far when I noticed that something is not quite right. It was very slippery! With the temperature right about the freezing point, the fine rain freezes when it hits the ground forming a very thin coat of glazed ice on the road surface. They usually call this “black ice,” as it is unnoticeable until you step on it or drive on it, thus making it very dangerous. If there is Black Ninja, there is also black ice. I was not prepared for ice running or should I say ice skating. I had no choice but to turn back and return home disappointed. I may be a little crazy, but not crazy enough to risk myself slipping or falling and breaking a leg. I wondered, if there is winter tires for cars, maybe there is winter running shoes with ice and snow traction. As I googled it up, I found out that there really are. I must have one of those. Or maybe I can even have Ninja spikes shoes so I can tramp black ice and can also scale walls and trees. Who said I’m crazy? Huh? Are you talking to me?